In mid-1989 I flew across the country to take on destination marketing for Durham, North Carolina. As a lifelong 6th generation westerner I was unaware that my roots as a Tar Heel go back more than 200 years before I was born. When one of my 6th great grandfathers, David Miller, was born in what would later become Orange County, barely more than a tenth of North Carolina’s 100 counties had been formed. At the time the future state’s population had grown to about 30,000 people, about the size today of the town of Sanford or Cornelius, a village along the shores of Lake Norman. North Carolina at the time stretched beyond the Appalachians clear to the Mississippi River. But apparently, it soon became too crowded for my earliest roots here. My 5th great grandparents, who had also been born in what by then was Orange County, may have been the first to move west, settling Pickens County, Alabama with Revolutionary War veterans along the Tombigbee River. By 1847, the progeny of those Tar Heel roots were headed up and over the Rockies, more than a thousand miles beyond the frontier. I find it fascinating not only to dig back into family history but to put the lives of my ancestors in context. My American roots go back to 1630 long before any permanent settlement of North Carolina had occurred and when there were only 4,646 settlers in all of what would become the United States. These 10th great grandparents William and Goditha Learned settled in Charlestown and were quickly followed within a decade by several others. Many ancestral lines had arrived at a time when the future U.S. population was around 300,000, a little more than Durham County today, where I live. Within a few years, most began small migrations west until by the late 1820s, when many such as the Sheltons and Neeleys migrated to points along the western frontier just as my North Carolina roots had. 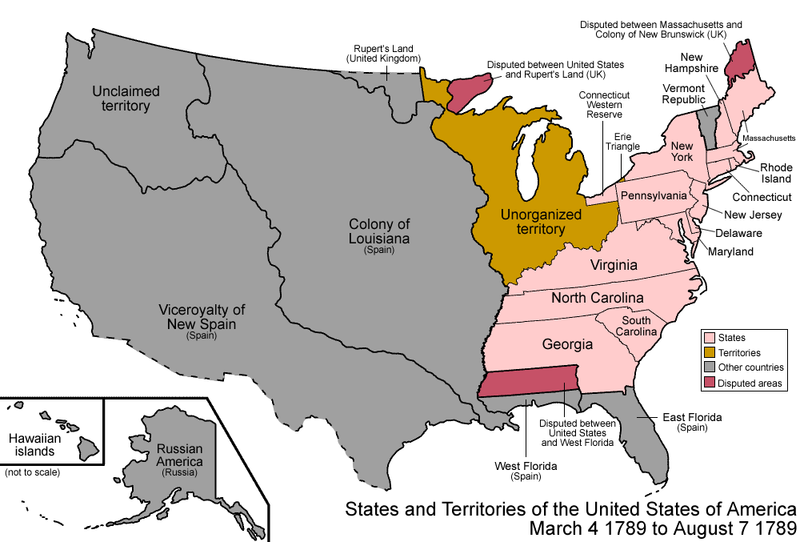 Back then the map of America looked as it does in the map shown in this essay. This was less than the population of Arkansas at the time and about 78% of westerners lived in what are now New Mexico and Arizona. What are now Montana, Idaho, Utah and Nevada were completely unsettled when my ancestors crossed the Rockies. Stretching behind them for 1,100 miles was territory yet to be organized in any way except for a few isolated military forts. All of my ancestors but two lines had crossed over the Rockies by 1850 when a compromise in Congress over slavery created the map at this link. The remaining two joined them by 1857 and 1862 directly from England and Scotland, respectively. By then, one of my great-great grandfathers, Charles Harper, who was on the vanguard wagon train west, had returned several times to guide others across, making at least four round trips over the 1,100 mile route. Each of these ancestral lines went on to create many other settlements, all within a few miles of the 111th Meridian West, including at the most northern end, my native land where ultimately all of these DNAs converged. I have no way to know if I am the first person created by the convergence of all those ancestral lines to fully reverse the migration 142 years later, living in North Carolina now for nearly 26 years. Many were crafts men and women before crossing the Rockies to become frontiersmen including carriage makers, tailors, seamstresses and business owners, but once over the Rockies they all became experts at economic development, which became my career. They mined sufficient gold to create currency, learned to “buy local” even if the goods were inferior because to buy from back east not only robbed local economies of their full value added, but local because it gave local manufacturers the opportunity and resources to improve. None were wealthy and some could not afford the trip west without needs-based loans from the Perpetual Immigrating Fund (PEF) which they inaugurated in October 1849, just over 24 months after the first arrivals west of the Rockies. It was capitalized by wealth transfers from donors and tithes paid to the Mormon Church and repaid once recipients made their way west from as far as Europe and other countries before being re-loaned. Precedent was given to those with needed skills as well as the relatives of donors who paid into the PEF. In all, more than 30,000 people used the fund to get a hand up over the nearly 40 years it was in existence before it was outlawed by reactionaries in the U.S. Congress. Repayments were forgiven if they were keeping people in poverty. Fourteen years ago this Spring, the Mormon Church resurrected the idea but as the Perpetual Education Fund to help members in need who are under 30 years of age and committed to repayment to get training and education that leads to employment or self-employment. Unfortunately, today many Mormons who pride themselves on not speaking ill about others are, by insinuation nonetheless insensitive to the poor unless they happen to be Mormon. This is especially true of those who have fled diverse cities for exurbs. Gallup surveys find that a greater proportion of Mormons are conservative than any other U.S. religion, 59% compared to 31% moderate and 8% liberal. Largely due to the migration from more diverse areas to exurbs, this is also true in places along the 111th Meridian where Mormons fled for religious freedom. It is even more true of those who are active in the church, with 65% conservative, 29% moderate and 5% liberal. But the views of those in white flight may have cost more than diversity of thought and discourse. The 6-in-10 (here and abroad) such as me whose participation has lapsed are half as conservative as those who are active, far more moderate and four times more liberal than active Mormons although many remain positive about the culture in general. A tiny percentage now trace back to the migration over the Rockies in search of new homelands but unfortunately, it is clear that some of the values and lessons from that period may becoming equally rare. The white flight of today is different than that which occurred in the late 1950s and 1960s. Across the country, it seems to have more to do with what some term as racial politics than with poverty or transfers to provide a hand up.